Four Seasons Resort Lanai at Manele Bay Book four nights at this luxury property on the relaxation-oriented Hawaiian island of Lanai and the nightly rate drops to just $259/night. I have stayed here, and it’s a wonderfully romantic property with an inviting pool (shown above, courtesy of Four Seasons), lovely beach, pampering spa, superb food, and two amazing golf courses. You’ll also have access via shuttle bus to sister property Four Seasons Lodge at Koele, a country manor house located inland amid serene gardens, where the same package lowers the rate to just $197/night for three nights, through December 22, 2010. The Ritz-Carlton Resorts in Grand Cayman, Jamaica, St. Thomas and San Juan Book a “Resort Reconnect” package from $229 to $359/night at any of Ritz-Carlton’s four Caribbean resorts and you’ll get both daily breakfast for two and either a $50 or $100 daily resort credit to be used in the property’s restaurants or spas. 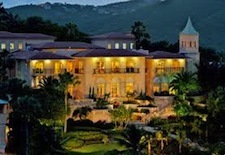 I have stayed at all four and suggest you choose Grand Cayman, set on the shimmering white sands of Seven Mile Beach, for all things water-based; Rose Hall near Montego Bay, Jamaica, for a fun vibe and great golf; St. Thomas (shown at left, courtesy of Ritz-Carlton) for a serene setting and sublime views; or San Juan for easy access and lively ambience, through December 23, 2010. Mandarin Oriental Miami Stay three nights at this luxurious Asian-inspired property on Brickell Key overlooking Biscayne Bay and the third night is free—making the average daily rate as low as $246/night. Striking lobby design, luxurious rooms (shown at right, courtesy of Mandarin Oriental), sweeping views of the bay and the Miami skyline, a private beach, a world-renowned spa and the acclaimed Azul fine-dining restaurant make this a perfect place to mix resort relaxation with all the energy the city’s downtown now offers, through December 23, 2010. Four Seasons Resort Scottsdale at Troon North Stay two nights at a rate of $225/night and you’ll receive a $100 resort credit to use at the spa or in one of the resort’s restaurants (stay four nights and your credit will be $200). 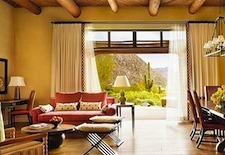 Set against dramatic desert rock formations and designed as a series of adobe casitas (shown at left, courtesy of Four Seasons), the property is a perfect oasis for active couples—hiking, mountain biking, golf, tennis, and other pursuits are all easily arranged. Or you can simply relax at the just-renovated 6,000-square-foot, two-level pool, through December 23, 2010. Fairmont Mayakoba Book a “Mayakoba Escape” package at this jungle-meets-beach resort on the Riviera Maya less than an hour south of Cancun and the nightly rate falls to just $159/night. 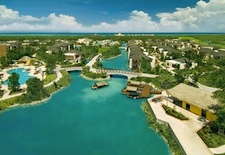 Spread over 45 acres of diverse lagoons, water canals, and coastal dunes (shown at right, courtesy of Fairmont), the property offers Mayan-inspired treatments in its Willow Stream Spa; six restaurants, bars, and lounges (plus access to eateries in two neighboring Mayakoba luxury resorts, Rosewood Mayakoba and Banyan Tree Mayakoba); five swimming pools; and a Greg Norman-designed golf course, through December 22, 2010.